Nigeria have dropped 14 places to 57th in the FIFA ranking for July released on Thursday. In June’s ranking, Nigeria improved from 45th to 43rd, but have now taken a slide to 57th, their worst ranking so far this year. As a result of the slide, the Eagles are now ranked 10th in Africa. Algeria, Ivory Coast and Ghana, ranked 19th, 21st and 25th respectively, are Africa’s top three. Tunisia (32nd), Senegal (39th), Cameroon (42nd), Congo (47th), Cape Verde (52nd) and Egypt (55th) completed Africa’s top 10. 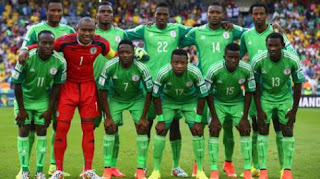 The only match that was used to rank Nigeria for this month was the 2017 Africa Cup of Nations qualifier against Chad in Kaduna, which Nigeria won 2-0. The other teams in Nigeria’s AFCON qualifiers group, Egypt, Tanzania and Chad were ranked 55th, 139th and 173rd respectively. Despite losing on penalties to Chile in the final of the recently concluded Copa America, Argentina moved up two places to become number one in the world. Germany dropped to second and Belgium slid to third. Colombia remained in the fourth position; Netherlands moved up one place to fifth; Brazil dropped one place to sixth; and Portugal maintained their seventh position. Romania moved up four places to eight; England moved up six places to ninth; and Wales shot 14 places up to 10th. Copa America winners, Chile also moved up eight places to the 11th position.